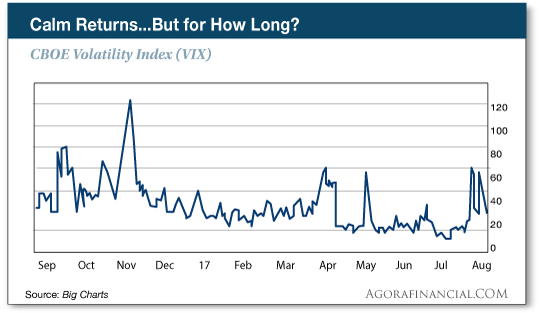 Volatility retreats again… but for how long? “Hiding in plain sight.” Those are the words our cryptocurrency evangelist Louis Basenese uses to describe the evidence that we’re approaching the tipping point of adoption for bitcoin and other cryptocurrencies. As evidence, he submits the following. It’s events like these — headlines nearly every other day — that drive certain cryptocurrencies into the stratosphere. Louis offers the following example: “On Friday, March 17, 2017, a tiny little cryptocurrency called energycoin traded at a little over three-thousandths of a dollar. The exact price was $0.003578. That’s the power of being in the right cryptocurrency at the right time. In the course of his research this year, Lou discovered an even more powerful subniche of the crypto market — newly created currencies called initial coin offerings, or ICOs. What makes them so powerful is that they’re attracting venture capital — a space that’s been right up Lou’s alley for years. “We’d be hard-pressed to find a technology attracting more fresh capital right now than cryptocurrencies,” says Lou. “Case in point, four cryptocurrency projects recently raised a staggering $660 million — in just 30 days. 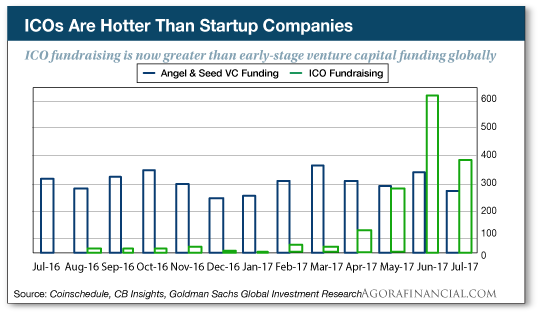 That’s more than the total global venture capital investment in bitcoin and blockchain for all of last year ($544 million). And now — this spring and summer — the trend is suddenly accelerating. And now, in only five more days, Lou anticipates the most lucrative ICO of all. We’re not exaggerating when he says he believes there will never be another one like it. Stocks couldn’t catch a bid today. The Dow’s down 38 points at writing. The S&P is off four. And the Nasdaq has given up eight points on the day. The yellow metal is up $1.60 to $1,292. Meanwhile, today we learn that new-home sales tanked last month. The Commerce Department reports that sales of new homes fell 9.4% in July, the largest single-month decline in nearly a year. We’re told it’s because new homes are simply out of reach for the average buyer. Sounds about right. But take heart. USA Today reminds us that new home sales are nonetheless up 9.2% over the same period last year. An air of complacency has returned to markets as summer starts to wind down. Jim Rickards says it won’t last. On Jim’s advice we’re still keeping a nervous eye on events in the Pacific; he’s convinced North Korea’s Kim Jong Un will react somehow to U.S.-South Korean military drills, scheduled to continue another week. “Many analysts,” says Jim, “assume that the North Korean situation is less critical today because the rhetoric has recently toned down, and the North Korean dictator, Kim Jong Un, said that he would delay his plan to fire missiles at the U.S. territory of Guam. “But that’s false comfort. Kim’s statement of restraint on Guam was conditional on ‘good behavior’ by the U.S. Kim’s idea of good behavior is if the U.S. calls off the exercise. Jim says a dangerous August is about to segue into an even more dangerous fall. For perspective, we need to zoom out on that chart above. It shows only the past year. Even the market shock from the “Brexit” referendum in Great Britain is now more than 12 months in the past. So what could drive that chart to new heights worthy of one of those red arrows? We won’t spill any more digital ink than we already have with the situation on the Korean Peninsula. Again, it’s going to be dicey the rest of the month. “Another ticking time bomb for a volatility spike is Washington, D.C., dysfunction, and the potential double train wreck coming on Sept. 29,” says Jim. “That’s the day the U.S. Treasury is estimated to run out of cash. 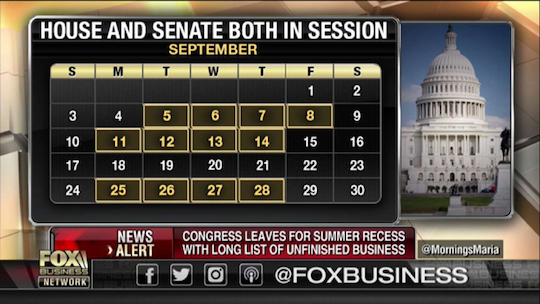 It’s also the last day of the U.S. fiscal year (technically, the last day is Sept. 30, but that’s a Saturday this year, so Sept. 29 is the last business day). Neither the debt ceiling increase nor the budget bill are assured of easy passage. “Both bills could be stymied by conservatives who want to tie the legislation to issues such as funding for Trump’s wall, sanctuary cities, funding for Planned Parenthood, funding to bail out Obamacare and other hot-button issues,” says Jim. “If the conservatives don’t get what they want, they won’t vote for the legislation. If conservatives do get what they want, moderates will bolt and not support the bills. Democrats are watching Republican infighting with glee and see no reason to help with their votes. The White House has already said that a ‘good’ government shutdown may be desirable to help crystallize the policy debate. 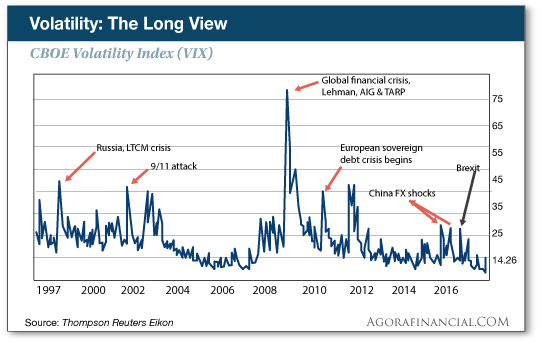 But wait — there are still more candidates for volatility spikes as summer turns to fall. “Other sources of volatility,” says Jim, “include a planned Day of Rage on Nov. 4 when alt-left and antifa activists plan major demonstrations in U.S. cities from coast to coast. Antifa are neo-fascists posing as antifascists; hence the name ‘antifa.’ Based on past antifa actions at UC Berkeley and Middlebury College, violence cannot be ruled out. This could be unsettling to markets and be another source of volatility. “Then there are the wild cards including a natural disaster such as a hurricane, which can threaten the U.S. Eastern Seaboard or Gulf Coast this time of year. Hurricane Katrina struck at the very end of August in 2005 and Superstorm Sandy hit the Jersey Shore in October 2012. Both did enormous damage and unsettled markets for a time. “Finally, we are entering a historically volatile time of year,” Jim wraps up. For more than a year, Jim’s been convinced that in the event of a market panic, markets will simply shut down. That’s what happened after Sept. 11. And in the event of a broader financial panic like 2008, the powers that be will simply freeze the system. You might be able to withdraw a small amount of cash each day for necessities… but that would be it. The system would be frozen while the politicians and central bankers reorganized the system. With a volatile autumn looming, it pays to get a copy of Jim’s 2016 book The Road to Ruin — showing you just how this “ice-nine” scenario will play out, and how to prepare. We’ve given away thousands of copies to new subscribers of Rickards’ Strategic Intelligence. If you haven’t joined their ranks yet, here’s where to claim your copy. “I’m at the end of the boomer generation and all this cryptocurrency stuff is confusing,” writes a reader we suspect is not alone. P.S. If indeed we’re headed into a period of volatility, we showed you yesterday how bitcoin outperformed gold on the four days this year that volatility jumped and the stock market tumbled. Jim Rickards is adamant that cryptocurrencies are a speculation and not a core asset for your portfolio… but oh, what a speculation it could be. And there are plenty other catalysts that can drive a well-chosen crypto into the stratosphere. The aforementioned Lou Basenese serves up some lucrative examples at this link.